Chinese fishing vessel Shi Dao caught pumping out oil into the sea near the Fiji Ships and Heavy Industries dock at Walu Bay in Suva last Saturday has paid its $20k fine and has left the country. Responding from queries yester­day, FPCL has confirmed Shi Dao has paid her $20,000 fine for breach­ing the Sea Ports Management Regulations 2008 after it was caught pumping out oil into the sea. “The Fiji Ports Corporation Limited (FPCL) is reminding mem­bers of the public and all port users that it does not and will not condone any form of pollution within the wa­ters of any Fiji Port,” the statement stated. “Concerned public and our pollu­tion team investigation and assess­ment have revealed that those in charge of the vessel had no knowl­edge of the offense and that it was a specific crew member’s negligence. Meanwhile Maritime Safety Authority of Fiji chief executive of­ficer John Tunidau said any action against pollution from ships within the port boundary was handled by Fiji Ports Corporation Limited. “FPCL can prosecute oil spills un­der the Sea Port Management Act and Regulations. 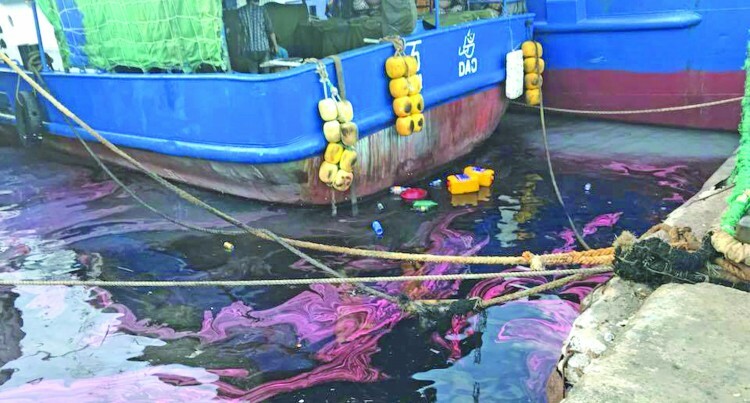 MSAF only re­sponds to an oil spill to contain and remove such spills when reported and if required for such incidents,” Mr Tunidau said. “For pollution outside of the port boundary, MSAF can prosecute un­der the MTA 2013 and regulations and also respond to such spills. “MSAF is always concerned of any marine spill that occurs within Fiji waters and especially when one of MSAF’s core role is the protection of Fiji’s marine environment from marine spills. “Such incidents should be reported immediately to FPCL and MSAF so that appropriate action can be taken immediately,” he said.